The Amazon Prime Rewards Visa Signature Card currently has an Informr score of 8.3 out of 10. This score is based on our evaluation of 6 sources including reviews from users and the web's most trusted critics. Amazon Prime Rewards Visa Signature Card is typically available to those with good credit scores (650 or greater). 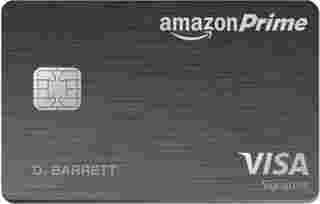 If you have Amazon Prime, the Amazon Prime Rewards Visa Signature Card is a good card to have. The 5% rewards rate it gives for your online shopping is unparalleled. The Amazon Prime Rewards Visa Signature Card could be a great choice for anyone who does a lot of spending on Amazon but also uses their card for other purchases. Ultimately, this card is best suited for Amazon shoppers who already use Prime and want to get more points back on their purchases. Amazon has given shoppers one more compelling reason to ditch the mall: a cash-back credit card that returns 5% on all purchases through the website. What’s more, there is no annual cap on how much you can earn using the Amazon Prime Rewards Visa Signature Card issued through Chase. Earn $70 Amazon.com Gift Card that will be instantly loaded into your Amazon.com account upon the approval of your credit card application. This card gives you optimal rewards if you’re an Amazon Prime member and you spend at least $64 per week at Whole Foods or Amazon. Even if you don’t buy groceries from Amazon, you get 5% back on all eligible purchases at Amazon.com. Although 5% isn’t as high as the Blue Cash Preferred’s 6% offer, you don’t have to pay an annual fee or deal with an irritating spending cap, so you could still come out ahead.